No amount of research or advice from fellow travellers, not any of the multitude of documentaries or published texts available in any library can prepare you for Cuba. This is one country, and I have visited several in my existence where prior research to visitation is essential, but still does not prepare you for what lies ahead after your arrival. The best advice I was given was to ‘Go With It’, have no expectations and for want of a more inventive phrase to just ‘Live In The Moment’. This is the Cuban way. Make plans yes, as you do for any new adventure but in Cuba don’t expect them to unfold accordingly. Five minutes wait can turn into two hours and don’t ask how long something will take. If you find yourself in a long queue for example at a bank or a supermarket chances are the vendor/teller is having a nice chat oblivious to the line of people waiting patiently behind. This is the Cuban way and no one seems to mind! When you get your head around this, you will be fine. We are in Cuba for the music of course. Of the many facets to this country, the music has been our motivation to visit. Musicians who wish to perform in Cuba need an official invitation, one of which we were lucky to receive from the Havana International Jazz Festival. Without this, we were not officially recognised as performers there and was an essential document needed for customs next to health insurance certificates. Needless to say, the music is present everywhere you go. If it was on the streets, in the bars, in the theatres or restauraunts, it was there and always excellent. I thought I had mastered maracas in Australia and couldn’t have been more wrong as was offered an impromptu lesson when one of these maraca masters witnessed my questionable technique. They can do it in their sleep and even before they are born at a guess. The food on the other hand, is not so. You would think that a Caribbean Country with Spanish, African and South American influences would have a somewhat exotic cuisine base. Theoretically this makes sense but realistically was not the case for us. Who ever heard of Cuba as a world food force the likes of Italy, France or even Sydney. When you spend time there, you realise why so. 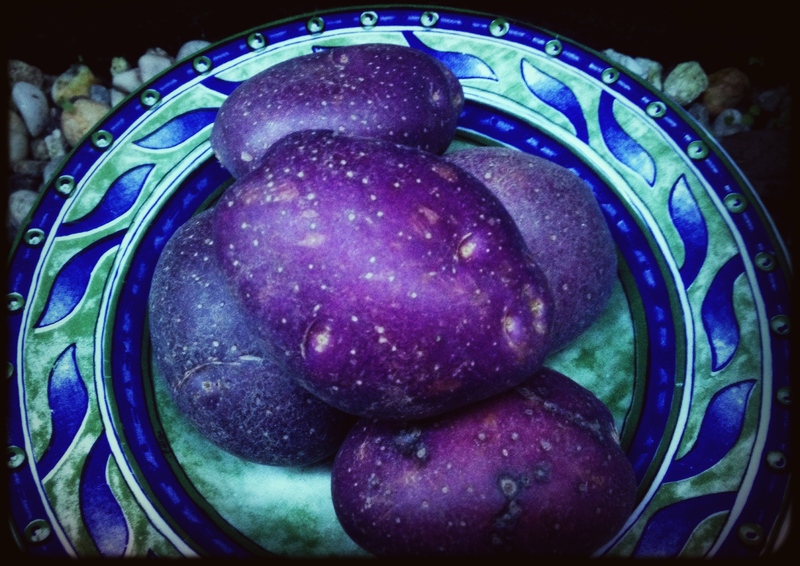 They eat and market seasonally which is a good thing in any foodies books. It’s just what is available and to whom which makes eating compared to what we are accustomed in Australia a daily challenge. 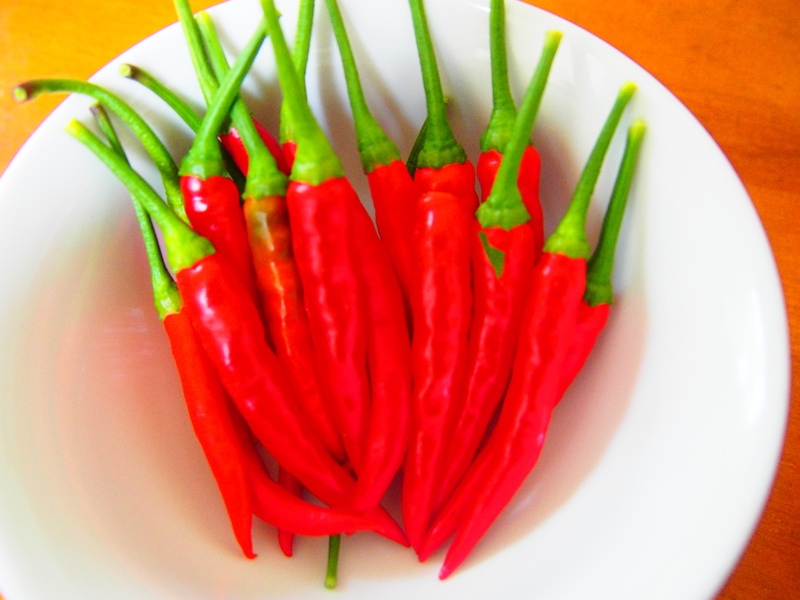 As a chilli addict, was having major withdrawals discovering nothing of any heat was available. Anywhere. Including at the fresh produce markets I visited with my Casa girl who through a lost in translation episode as she no English and I no Spanish, purchased a bag of miniature capsicums disguised as ghost chillies. They looked promisingly hot. Alas they were not, with little flavour to speak of. At the beginning of the trip we decide upon the breakfast option at our Casa for an extra five CUC a head. (I decide later in the trip to prepare our own breakfast as we have access to their kitchen in order to save our diminishing cash supply – mostly everything must be paid for with cash in Cuba). This is always an omelette, slices of processed ham, cheese, papaya chunks, pineapple or guava juice, bread rolls and coffee. The coffee is very good. 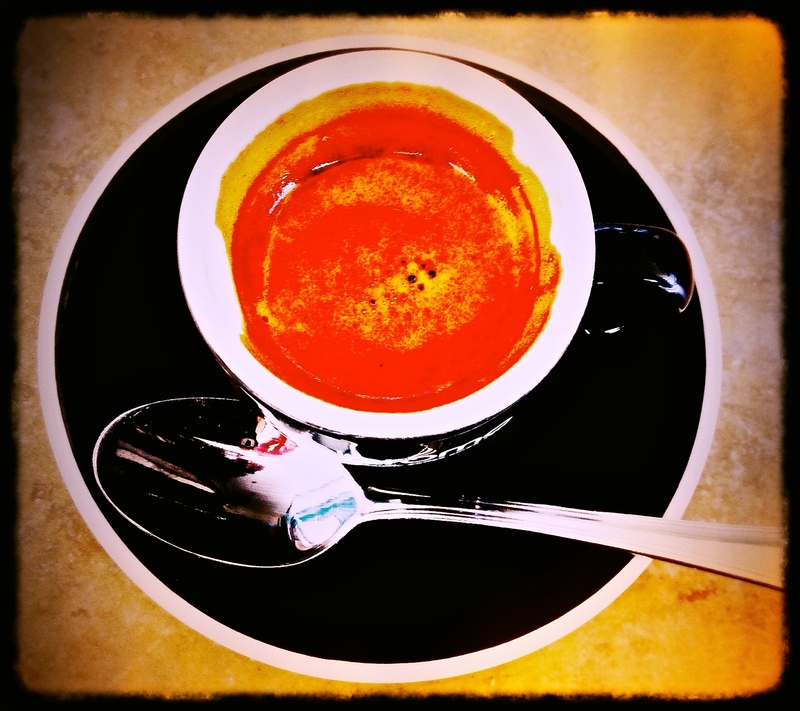 Coffee is one of Cubas main exports next to rum and tobacco, so mercifully they do know how to make a decent espresso. Out of the three separate Casas we stayed in there was virtually no variation in the breakfast presented to us, with the exception of bananas or pineapple instead of papaya. With the uncertainty of food options in the streets, the fruit was welcoming as it very well could be just rice and beans for the rest of the day. We ate many bananas. Our first restaurant in Cuba, not knowing any better and dog tired from travel was a tourist trap. It was the closest in proximity to our Casa and Lobsters are ordered. We are in the Caribbean, right? Wrong. Anthony Bourdain in No Reservations has sung praises of the Cuban Lobsters. Perhaps he dined at one of the more affluent expensive tourist restaurants which do exist commonly in Cuba, but these are out of our reach finacially being a five piece band on a guitar-string budget. Tonight the taste is tantamount to fried rubber. Taking the iniative I enquire as to the special of the day – In broken English the waiter recommends the squid ink rice with shrimp and octopus. It’s dark, almost pitch black however very tasty. A wiser choice than the lobster at this establishment. Advice for future travellers to Cuba – go for the specials. There is an element of freshness to these dishes as opposed to the menu options designed purely to cater for the Western World palate. Our next dinner outing is at a Casa Particular around the corner from ours. This is a private home with a dining room set up in the front and always an affordable option so locals often dine in these homes too. Here we can expect a typical Cuban meal of which I am curious to try. The menu is entirely in Spanish (the tourist restaurants always have English translation) so our menu decoder in the back of the Spanish phrase book comes in handy. First course is a vegetable noodle soup and is very good, not needing any extra salt and served with lime wedges. So far so good. Second course is salad. Every salad you order in Cuba appears the same way – Thinly sliced tomatoes, cucumber, an avocado cube and a mountain of grated cabbage on the top. This one also had additional ingredients: One boiled broccoli floweret, finely diced boiled to within an inch of it’s life carrot and a few unidentified green leaves. There is no dressing. Unimaginative but healthy which is what I remind myself during consumption. The third and final course arrives. Picadillo is a traditional dish of ground beef, capsicum, raisins, ham, beans and rice. It is in a mound shape on the plate and next to some fried plaintains, also another Cuban delicacy. If any spices have been used here I am unable to detect them. Right about now I’d murder for chilli sauce or Himalayan Sea Salt! Still, a cheap and cheerful meal with a few bottles of quite good Chillean wine has cost us around thirty Australian dollars for the five of us so we are happy and content musicians. Back to the music. After a brief sojourn to Cienfuego and Trinidad across the country and back, we are slowly getting into the Cuban Swing. Of these two towns Trinidad was the most beautiful. Vibrant colours, cobblestoned streets, loudly coloured Chevrolets navigating the narrow streets, music music music and a long awaited dip in the Caribbean Sea via Anacon Beach. Our travel from and back to Havana to visit these places was also colourful. Hurtling down the ‘single-laned-suicide highway’ dodging horses and carts, tourist buses, potholes and other travelling vehicles of varying speeds left us fairly frazzled! My knuckle bones white from the trip and grip, no seatbelts, thirteen of us piled into an elongated Jeep and only half a seat for the 300km journey. I do pray we make it to Havana in one piece. Stan says, just don’t look. We stop to refuel at a farm rather than a service station off the road down a lumpy dirt track. The motor still runs while petrol is poured into a funnel into the tank and the driver smokes a cigar nearby. I don’t look. Finally, it’s the day of our first gig. By now we are used to being given very little information in relation to what we are doing till the final minute. The festival program, fresh off the press has just been handed to us. We have learned not to ask questions as usually is answered with a shoulder shrug. We get told what we need to know, when we need to know it and ‘hurry up and wait’ has taken on a brand new meaning in Cuba. Our soundcheck time is 1pm and they tell us we need to be there at 11am. OK. Except it’s now 1.30pm, we haven’t yet soundchecked and the program of four bands starts at 2pm. ‘Should we eat’ I suggest? Yes, says Mary but make sure you are back here for soundcheck. Whenever that will be. Then we are told that we will be on second, rather than first. So we sit out the first band, but are told half way through their performance that we will be on third now. Only to be informed next we will be last. This is Cuba afterall, things change at the last minute and we are beginning to realise this. Also, we are to perform for no longer than thirty minutes maximum. So when we finally get our spot, at 6pm after waiting around for hours, we give our thirty minute adrenalin fuelled performance everything we’ve got. My word, we do. As the week goes on we are making a few inroads into this country and just how they live and operate on a day to day basis. Staying in a Casa enables ground-level knowledge being right in touch with the locals, language barrier and all, an experience not to be had if a tourist hotel option is taken. This becomes most apparent when we decide to start cooking for ourselves and need to shop for ingredients. We have a stove-top and some very basic kitchen utensils so why not? Just what to exactly without any knowledge of produce available or where is our next challenge. We’re pointed in the direction of a supermarket co-incidentally located next to the Jazz Club and situated opposite the famous Riviera Hotel (Frank Sinatra’s old haunt). There’s aisle after aisle of canned, boxed and plastic packaged items. Bag upon bags of rice, pasta and lentils and an extensive frozen food section, not much in the way of vegetables other than one lonely bag of frozen broccoli. No eggs in sight. Looks like dinner tonight will be pasta and a canned pasta sauce. There are no spices whatsoever other than one Maggi brand labelled Sazon and at a price of 1CUC, this will not break the band bank and is our only option. There’s one whole row of identical plastic oil bottles labelled ‘Soya’ telling me Olive Oil is out of the question. Blindingly flourescently lit, the power went off for about ten minutes while we were waiting in another long queue at the checkout. No one seems fazed, taking the opportunity to chat with each other rather than pull out their smartphones to stare at screens in order to pass the black-out time. Wifi and internet access exists but is not widely available or affordable yet in Cuba. A refreshing prospect. People talking to each other again. Who’d have thought. Back at the Casa and into the kitchen I go. Glenda our host is curious and watches on as to just what I will prepare there. I cook the pasta (in bottled water), heat up the canned sauce and serve to the band. She appears fascinated and all the while chuckles. I wish to ask her what is so funny, but she no English and I no Spanish so we laugh together at who knows what. It’s ridculous to me because I never cook this sort of thing up at home. And until I learn how to speak Spanish properly, I’ll never know what amused her so. However, I must somehow communicate with her as I want to visit a fresh produce market and she would know. Even Bourdain says there is a great one and the translator book helps now more than ever. She comprehends my desire, and even better will drive me there herself in the morning in her carro. Turns out it is three blocks and two streets away from the house and is the exact same one Bourdain went to. We make the short journey to the marketplace in her Fiat Polski, a bright blue tiny two-door with no boot leaf-blower-engine sound-alike car. Luckily she knows all the vendors here and does my negotiating and paying for after I just point at stuff and open my wallet. Everything here is in season and every stall has all of the same things on display. Tomatoes, onions, garlic, cabbage, cauliflower, pumpkin, capsicums, carrots, okra, cilantro, bananas, papaya, pineapples, limes, guava, avocados and mangoes. I buy some of everything as it all looks wonderful. (I do find out later the mangoes are actually out of season. 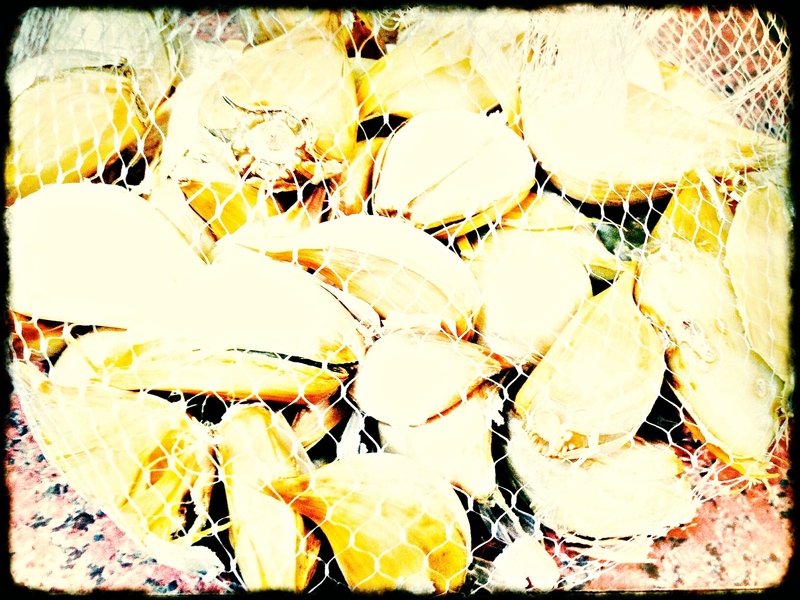 They were of stringy texture, but tasted pretty good and was a welcome alternative to the ever-present papaya). The avocado is enourmous and will take a few days to ripen. Took a week as it turned out and was a complete meal for all of us when it did. 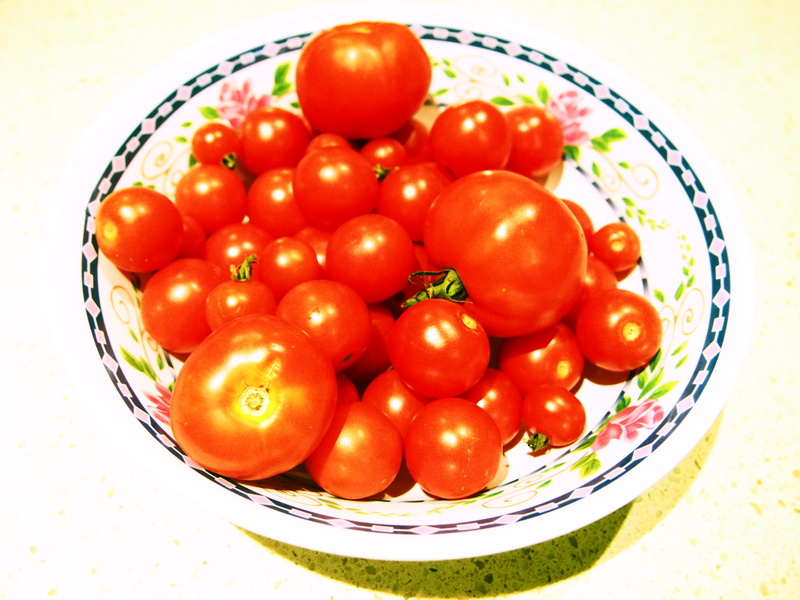 I calculate this abundant fresh fruit and vegetable supply has cost around $6.50 AUS, and will see us out for meals over the next week. Then there was the meat section. Slabs of pork, different cuts and sections all displayed on an unrefrigerated bench top in the open with a couple of blowies hovering. Bourdain had gone there but I’m afraid I just couldn’t bring myself to do the same. I know the boys of the band would have loved me to bring home the bacon but being a temporary vegetarian won’t hurt them. Plenty of opportunity to resume their carnivoric diets back in Australia Xmas day and beyond. I decide on a pumpkin soup first, as we’ve now a huge chunk of it plus carrots, onions and garlic galore. Normally I’d roast all of this drizzled in Olive Oil then wizz it up with stock and spices and re-heat on the stove-top. Roasting is not a possibility in Glendas kitchen as it turns out. I point to the oven she possesses and she hand gestures wildly while repeating ‘Non, Non, Non!’. I figure this translates as it’s on the blink. So it’s all in the one big pot on the stove, boiling furiously. Glenda has a blender thankfully so I can wizz it up in this. I must use my imagination when it comes to seasoning this soup with the absence of stock. I use the Maggi Sazon and wait for it…a generous dash of Havana Club. Amazingly, the end result is delicious. I ask the band to guess all the ingredients. One of them correctly guesses the rum. (My recipe for ‘Rumpkin Soup’ is at the end of this blog). Wonders never cease in this country. We’ve kindly been invited to the British Ambassadors palace for their Xmas party with lunch included in exchange for a private Manouche concert, a fair enough trade. The guests were a mix of Ambassadorial staff and representatives from other Embassies, around forty in total for this pleasant afternoon soiree in the grounds of the stunning building. Which, co-incidentally was located three blocks from our Casa, within easy strolling distance for carting accordion purposes. The catering for this was, as you’d imagine generously salubrious. Large platters filled to the brim of more of the same seasonal cuisine – rice and beans, cabbage salads, cucumber and tomato slices and lashings of avocados. 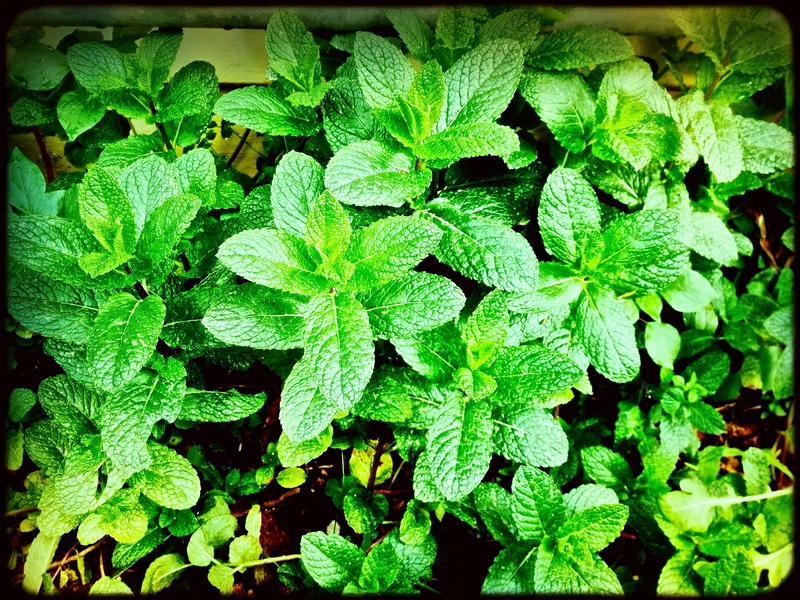 And an endless supply of the omnipresent Mojito. There are barbequed pork steaks piled high as well as fat chicken breasts. (Our Embassy girl Alice mentions she has never seen such fat chicken breasts after a year of service in Cuba and where these would have been obtained she couldn’t comment). Of course, the band pile their plates to capacity then have seconds and thirds. Then we play for them. They don’t usually have live music at these do’s, so they are very appreciative of this. It goes both ways as we haven’t eaten like this yet either. The most interesting of facts the British Ambassador to Cuba informed us over lunch was that Mick Jagger had been for drinks there a few weeks before us. Turns out Mick is angling for the Rolling Stones to perform in Havana at some future point. He has been laying the groundwork for what will be, when and if they can pull it off, a concert of a lifetime. Because, the Rolling Stones are by a long shot Cubas most endeared band ever. And they have never performed there. This is a valid reason to return to Cuba I decide right there and then. The Ambassador will keep us in the loop with developments <insert smiley face here>. Amidst the communication, banks and food challenges we are met with everyday and our subsequent overcoming of these, the Jazz Festival has been running alongside and we have been performing and also watching other fantastic and diverse bands from all over the world. To our delight, our music has been received very well by both Cubans and international visitors alike. It was a major undertaking getting our five piece band Feel The Manouche to Cuba. 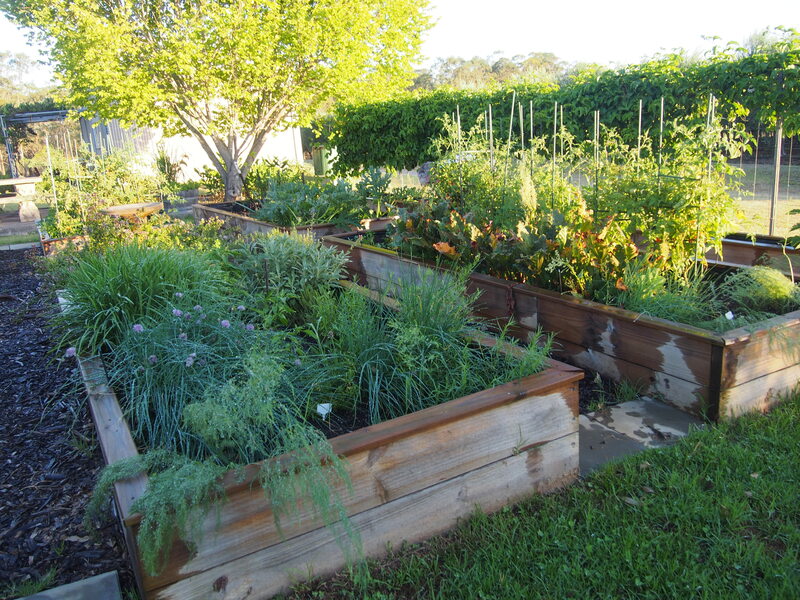 With the fully funded Pozible campaign generously supported by family, friends and fans our mission was successful. One of the venues the Cafe Miramar even invited us back for an unscheduled encore performance on the last night of the festival. Gestures such as this are uncommon and made us feel that all the effort was worthwhile. We made many new friends and contacts, both English speaking and non as communication through music the universal language, we’ve now seen first-hand absolutely applies in Cuba. Disclaimer: The following blog does not contain anything related to the way Cavemen eat, is not Gluten-Free, Non-Dairy Vegetarian or Vegan. It’s not for the food-intolerants. 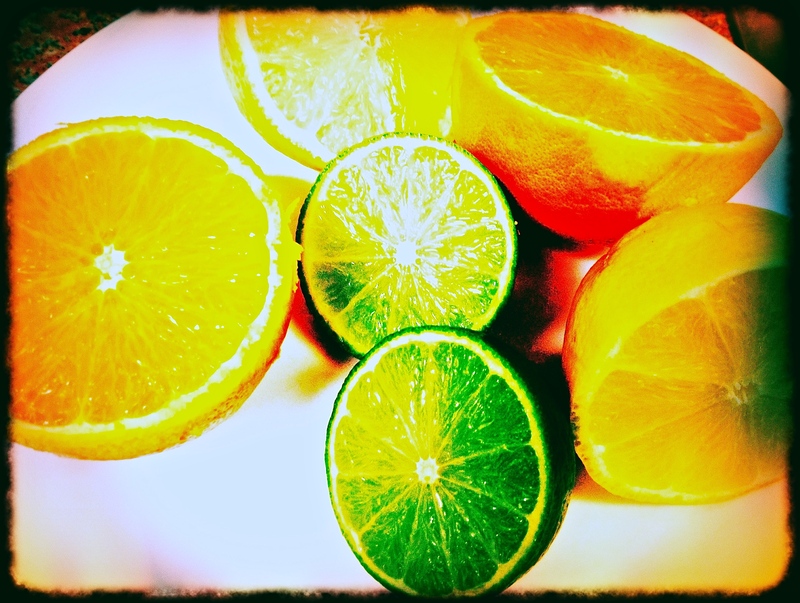 The citrus pictured is here because is included in the Slow Roast Pork Shoulder Mojo Marinade and Mojito. I have always believed in music and food as the ultimate companions especially when both of them are of exceptional quality and experienced simultaneously. We really can’t expect anything less in todays hipster environment of the unending and continually evolving dining boom cutting us off at every pass. If you are a constant travelling musician like me, food and coffee apps are invaluable and can point you in the right direction when you find yourself in a foreign land, if you haven’t had the time or inclination to do the research before you get there. Who does that anyhow? I do if I have the time but apps like Zomato, TripAdvisor and of course Bean Hunter have been saviours with an average of ninety-five percent success rate or win factor of approval and satisfaction. Yes, some time is required scrolling your phone but in the pursuit of excellence and value for money, this is necessary. There was only one double espresso that was undrinkable, and three of outstanding quality after circumnavigating the country three times this year and consumption of around sixty-three of them. Top 3 where Alice Springs, Toowoomba and Nowra. Regional areas, who’d have thought and quite serendipitous. Call me a coffee snob and I do realise a bad coffee purchase is a first world problem. But If I’m going to hand over four plus dollars for that miniature cup of single origin goodness with notes of caramel, chocolate and floral overtones that will put a smile on my face, I expect it to be palatable and delicous. And the travelling and food pursuit continues while I am fortunate enough to perform around the country and various destinations of the world for the duration of 2015. Two significant factors have occurred recently while I have been home for a spell, unpacking and reacquainting with the ragdoll who is yet to forgive my absence and rightly so. Firstly, a friend told me over dinner the other night in Croydon that I must watch the movie Chef, which I did the very next day. While watching this truly inspiring foodie movie, which also includes a mighty soundtrack of food and specific music pairing, I was also keeping an eye on a crowd funding campaign being run for my band Feel The Manouche to attend the Havana International Jazz Festival in Cuba, which was creeping towards the finish line of being fully funded. As of writing, this project has now been funded and we are going to Cuba in December. Bring on the Cigars and Mojitos I say. You will have to watch Chef to understand where I am going with this. If you have seen it you will most likely comprehend my obsession and possibly have developed your own for the Cubano. 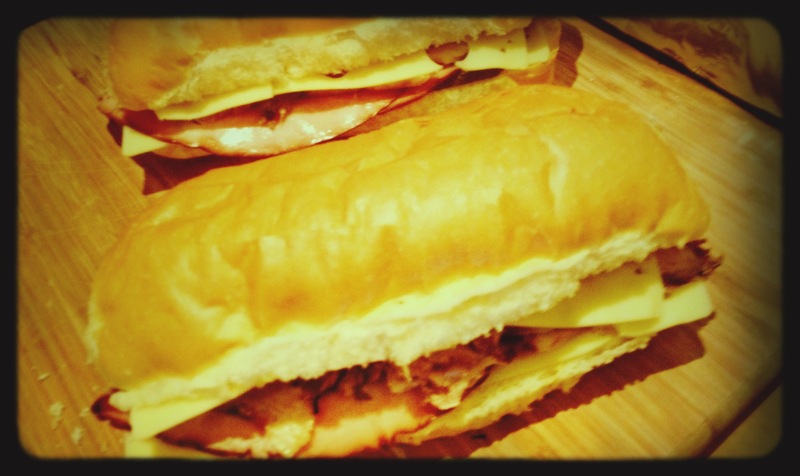 The Cubano is the official name for the Cuban Sandwich, which originated in Florida early last century, introduced by the Cuban cigar builders who migrated to Miami. In Cuba, where it’s origins date back to the 1500’s, it is simply known as ‘Sandwich’. The history of the Cubano, evolution and how it came to be a universally known is fascinating and can be read in more detail here or you could just get on with trying to get the pork shoulder slow roast part right which is what I believe must be the secret to the success of a party in your mouth, sensational Cubano. 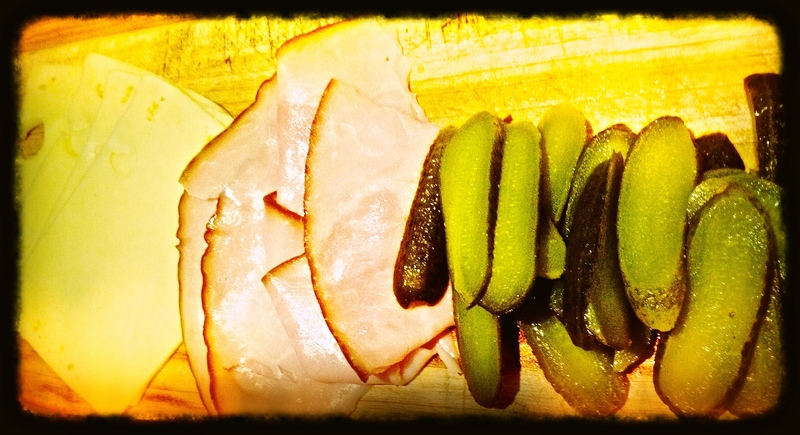 The mustard, swiss cheese and dill pickle slices are layered on top of the mojo pork with smoked ham slices. 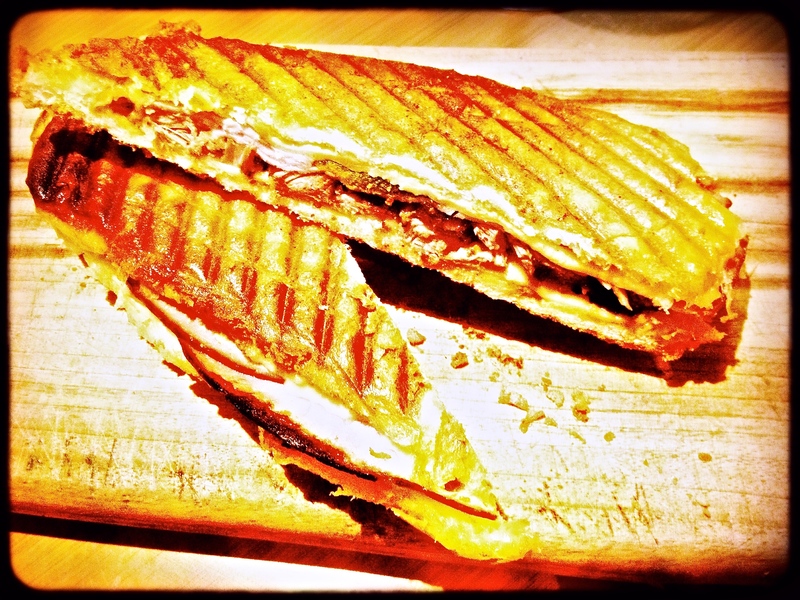 These are all contained on what is referred to as Cuban bread (a french-style baguette will suffice) then smothered with softened butter and placed in the Plancha (sandwich press) and cooked till the cheese has melted and the bread has turned a beautiful caramelised golden colour. This is then cut on a diagonal bias, so they are in triangular shapes. For Cubano authenticity they must be in triangular form. Makes sense, easier to eat as there’s a lot of information on that sandwich. And easier to digest with Buena Vista Social Club soundtrack on while consuming. I don’t own a Plancha (yet) or a sandwich press, but you can use a cast iron grill pan and place a brick wrapped in foil on the top of the sandwich to press down instead. I’ve got the pork shoulder marinating now overnight in a combination of spices, adapted and reformed from a few of the many recipes I found on-line for the traditional Cuban Mojo marinade. 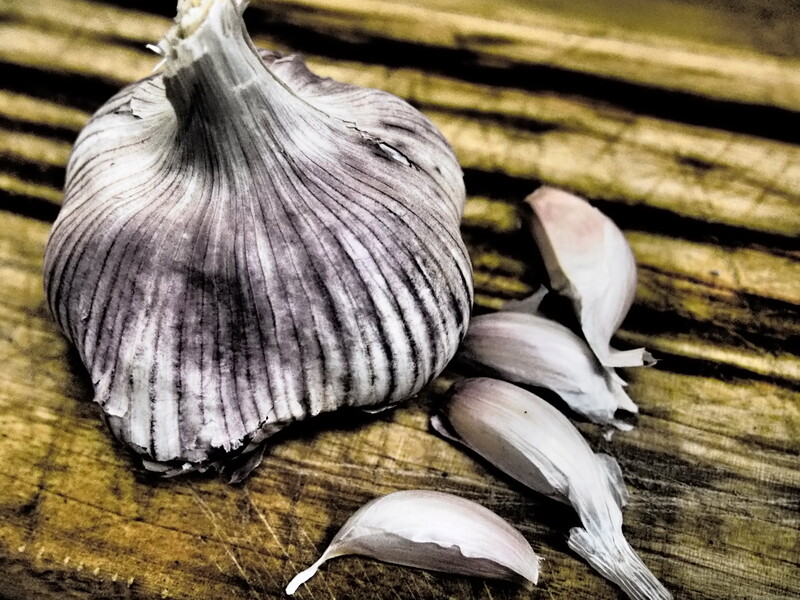 Most importantly, am using the garlic from our friends Organic Garlic farm in Kempsey of which have an enormous amount, and can’t think of a better way to use it, seeing as the marinade requires at least ten cloves. Some recipes suggest using twenty. Best not cook this up if you are flying anywhere the next day or two after. So the shoulder has been marinated now for twenty-four hours. Cuban roast experts suggest forty-eight, but am keen to get this roast going today being overcast and semi-cold in Sydney, hanging onto Winter being of cryophilic persuasion. I’ve not roasted a pork before, it’s always lamb so want to get this right. In Chef, they roast the shoulder inside a kettle drum on hot coals. Not being near a Bunnings to obtain these appliances, into the oven it goes. The Cubans also don’t cover the meat with foil, but let it get all browned up at a very high temperature 250C, then drop it down to 190C. So far the scored fat on the top has browned and crisped up a bit (a good sign) at the high temperature, so have lowered the heat now and covered loosely with foil just for good measure. The last thing we need is dried out meat, we want the juice factor on completion. Fingers crossed. Have to say am fairly happy with the way it looks, but it’s really only about the taste, so it’s now having a good rest before I start carving it up and we’ll find out then if this roast has any Mojo. Mercifully, it does. Now all that is left is to assemble the Cubano then grill. Have sliced the pickles, melted the Pepe Saya Butter, sliced the pork, cut open the bread rolls (which aren’t Cuban, but the closest softest ones could find) and finally covered the brick with foil, and of course made a Mojito to go with it. Getting the Mojo Pork right is the first important step in the Cubano process, the next step is the assembly which is also vital, and don’t be too shy with the filling amount as it’s all going to get squashed down with the foil brick so the flavours all meld together in a nice little flat crunchy toastie. Start with a good smearing of mustard on each side of the open bread roll, then a layer of cheese followed by the Pork, Ham, Pickles, then a final layer of Cheese. Liberally spread the melted butter on both outsides of the roll and it’s now ready for the grilling stage. It’s taken two days to make this sandwich but the end result has been worth it, and pretty much looks like what it should as far as Google Imaged Cubanos go. Must say though, am looking forward to tasting the real deal when we are in Cuba later this year. In the mean time, Es hora de celebrar. El exito Cubano, trae en la Mojitos! Remove Pork from fridge, place in roasting tin and let come to room temperature. Turn oven down to 190C and baste every half hour with pan juices. 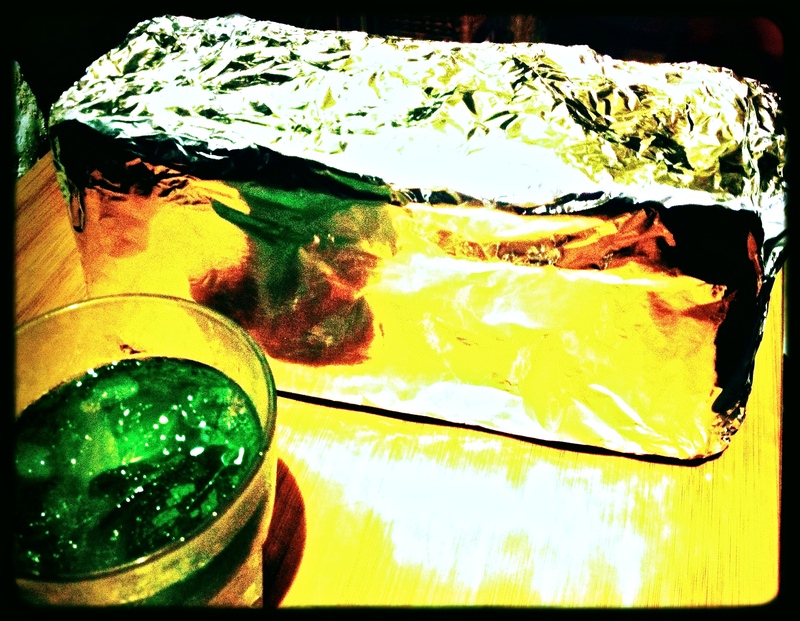 Remove from oven, cover with foil and rest, rest, rest! Surprisingly several songs exist with ‘Orange’ in the title like Orange Crush by REM, Clockwork Orange by Kraftwerk, Bruised Orange by John Prine, Orange Wedge by the Chemical Brothers and Orange Blossom Special of course. My favourite is ‘Orange Juice Blues’ by Bob Dylan & The Band. Not so surprisingly the term ‘Orange’ in these songs is purely metaphorical having nothing to do with the actual fruit itself. I tend to side with cooking exploitations of the very versatile Orange rather than writing or listening to songs about them. 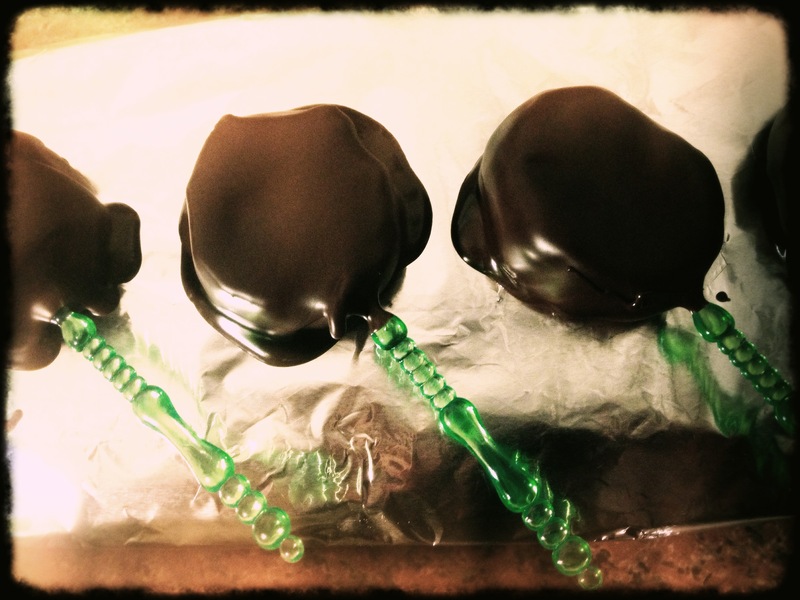 And no ducks were harmed in this recipe either! 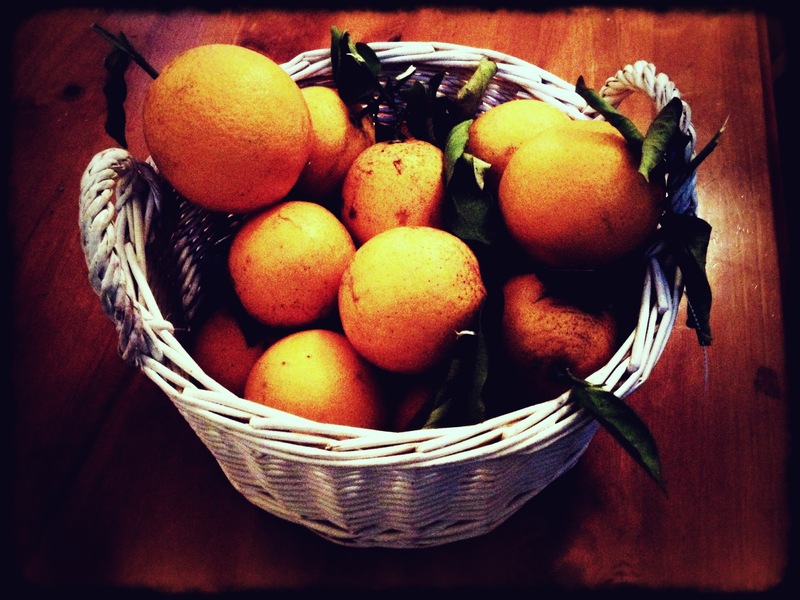 My earliest memories of Oranges stems back decades ago to my childhood netball ventures. It was during rigorous Saturday afternoon games, when juicy segmented pieces of oranges presented in Tupperware containers was our hydration of choice. Fancy electrolyte sport drinks and bottled water hadn’t even been thought of back then and when H2O was required this entailed a trip to the bubbler queue. I still opt for an Orange segment over a swig of sugar-loaded Gatorade anyday. The quest is on-going during this long cold Winter to come up with tasty, to-the-bone warming and at the same time healthy, flu-fighting soup recipes and so far have succeeded in avoiding being bed-ridden with any un-welcome ailments even though have been in the front-line of exposure to sniffly individuals on pretty much a daily basis. (It could very well be due to the large amounts of garlic I consume which contributes towards the distance kept between us). More elaboration on this here – Flu-shot in a soup bowl. 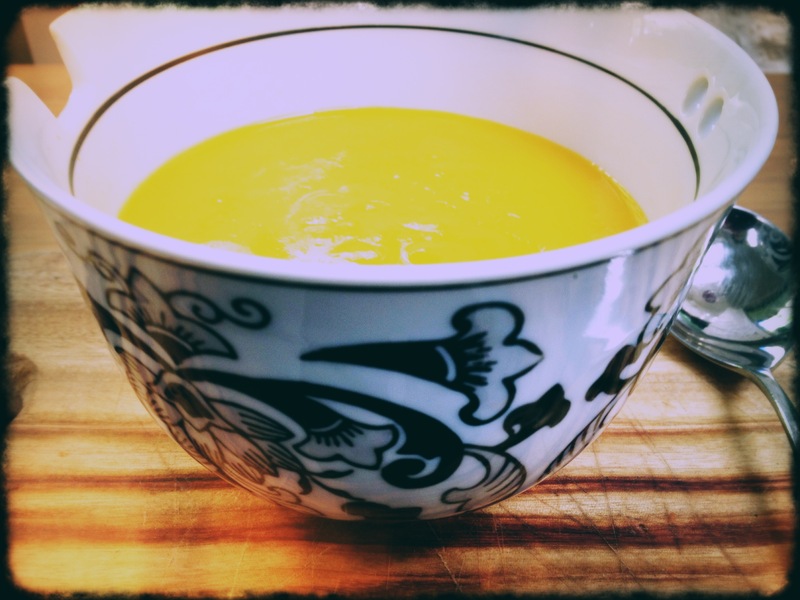 The proven immune-boosting ingredients used in Carrot and Orange Soup takes flu-shot in a soup bowl to a new level and there is no compromise in taste either. The citrus bursting Orange flavour in this, next to robust beta-carotene ant-oxidant loaded Carrots, and Fennel which incidentally is also loaded with Vitamin C produces an extraordinarily delectable and moorish bowl of goodness indeed. For added eupepsy properties, I added a good lug of grated fresh ginger to further heighten the experience. 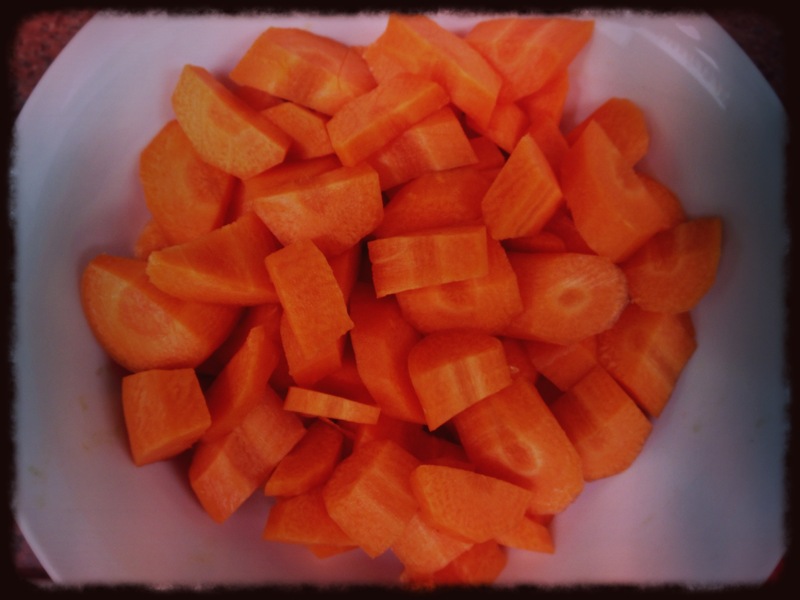 Once assembled, this soup becomes a vision of orange exquisiteness due to the high carrot and orange content. 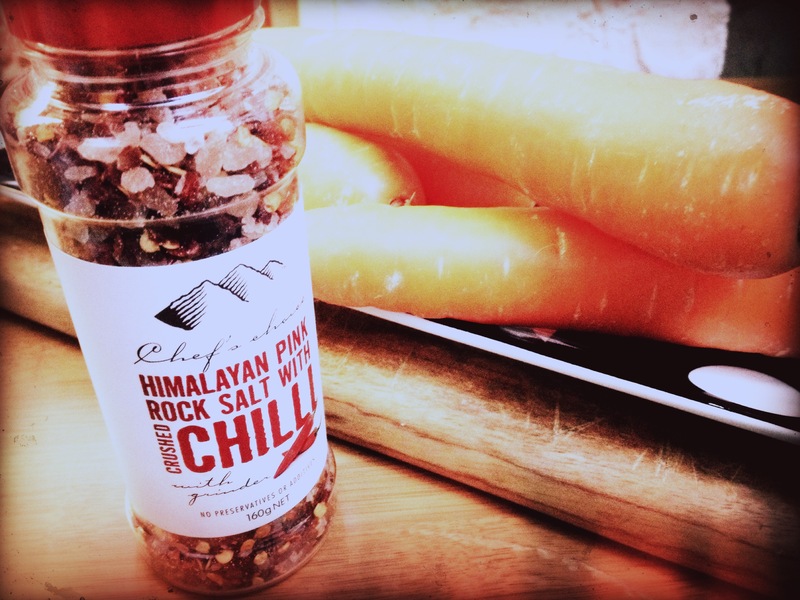 My new go-to version of Sea-Salt, combined with Chilli Flakes. 10 out of 10! 1) Heat Coconut Oil in large saucepan over medium heat then add onions and sauté gently for a few minutes. 3) Add Stock, bring to the boil then reduce heat and simmer for 20-30 minutes. 4) Turn off heat, let cool slightly then transfer contents to a blender, whizzing till smooth consistency. (Remove orange peel before blending if you don’t want it too orangey). 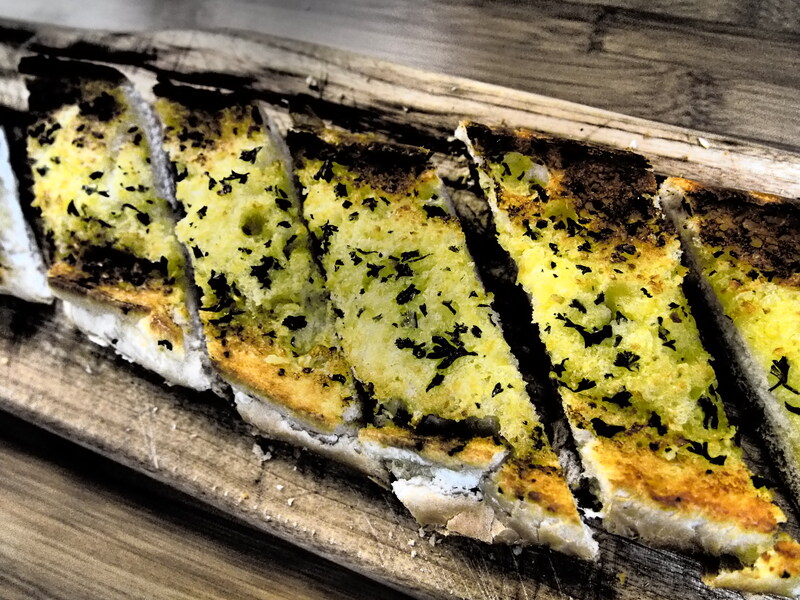 (Optional: A scattering of toasted sesame and a bit of chilli sea-salt (pictured above) goes very well with this). No need for any green garnishes, as detracts from the orange flavour). Annoyingly, there is a not so enjoyable side to Winter in the form of the Flu. And the hot topic on the talk-back radio I caught today comes as no coincidence coinciding with the cooler weather approaching being about none other than the Flu-Shot. It’s not something have given much thought to before and only subliminally being aware of its existence after seeing posters on the walls at my GP’s office, or after hearing people talk about it. Visiting the USA last September, it was hard not to miss the confronting billboards displaying the question, ‘Have You Had Your Flu-Shot Yet?’ placed along freeways we were frequenting? Impressive and ominous advertising for a jab. I won’t bang-on about vaccinations here as it’s the recipe am in a hurry to share, and do realise the Flu-Shot is necessary for some people such as those chronically ill. However I truly believe if you are otherwise a healthy specimen with your immune system in top match-fit fighting condition achieved through consumption of good food full of vital nutrients on a regular basis, those nasty little flu germs should have little chance of successfully invading your body and creating the irritating havoc they are very capable of achieving. 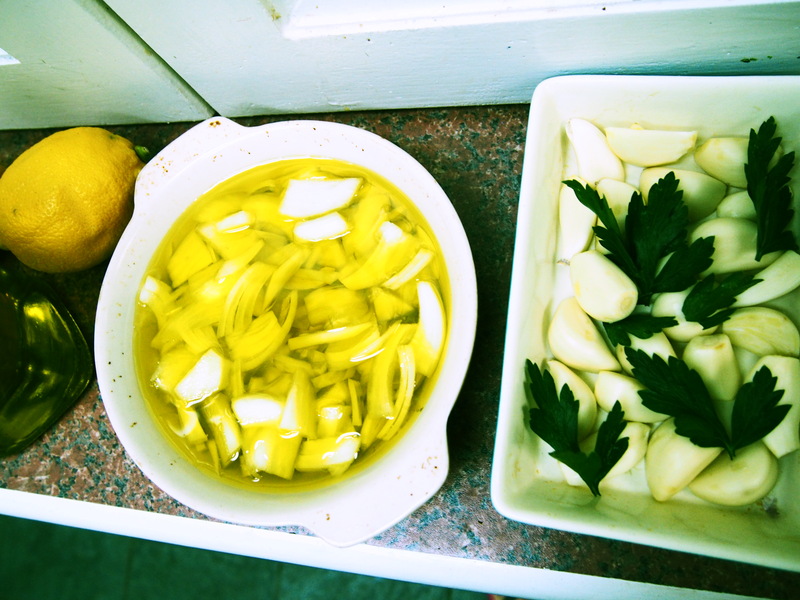 Roast Garlic and Ginger soup is a good place to start. Not only is this incredibly tasty, but it can be referred to as having a ‘prophylactic’ nature, which translates to using with the ‘intention’ of preventing disease or infection but does not actually have an effect on the severity or duration of the symptoms if you are already sick, just what the Flu-Shot is designed for (I think devouring this soup is a more enjoyable experience). 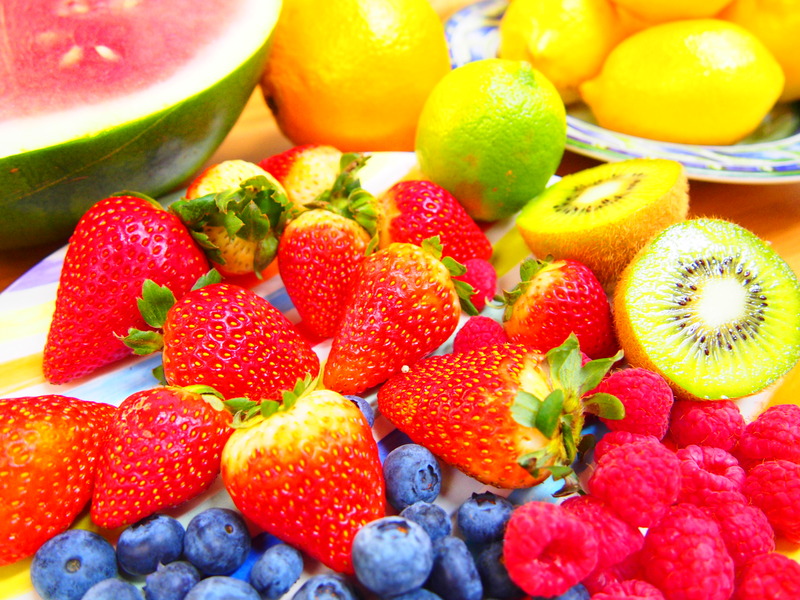 Consuming on a regular basis, it can also decrease the frequency of colds and flu. 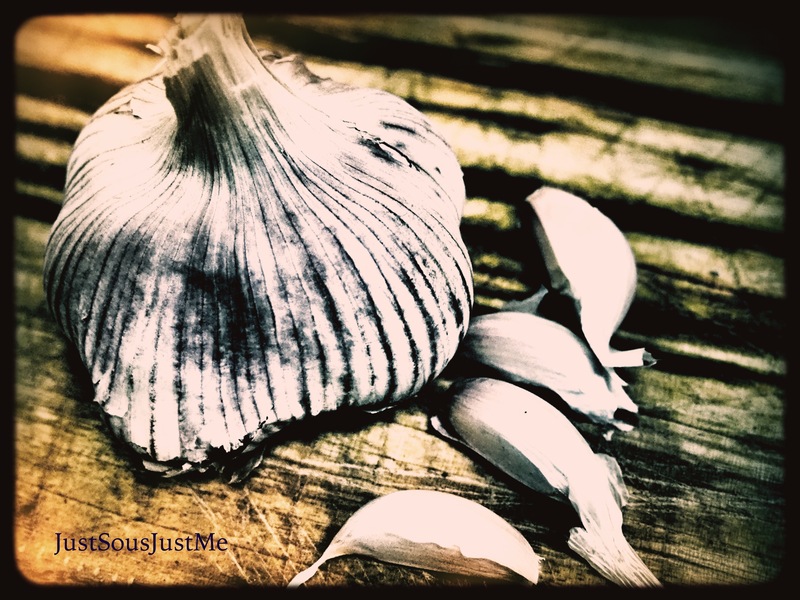 There’s no secret about the therapeutic properties of Garlic having been used for thousands of years to treat various ailments particularly respiratory issues. 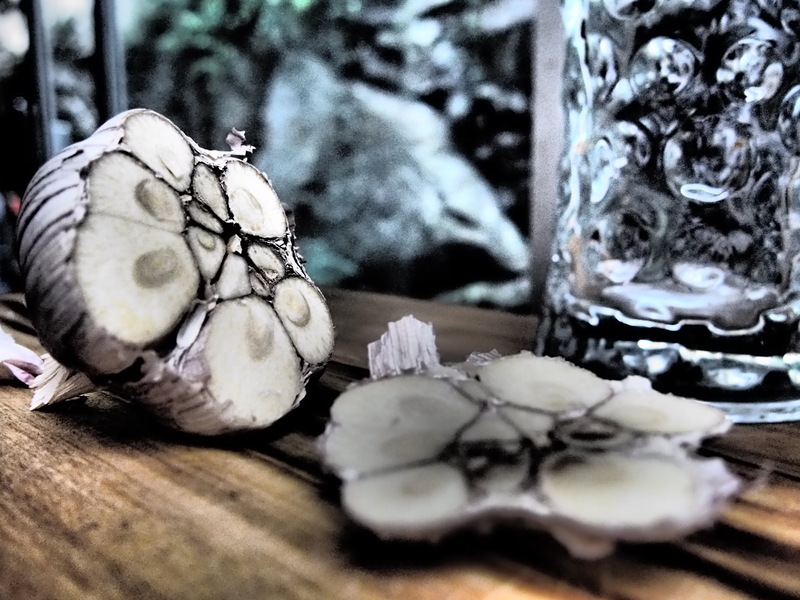 Garlic is the main star of this show, with Ginger in the co-starring role. Besides benefiting digestion, which ultimately leads to better immunity, Ginger also has anti-inflammatory and anti-bacterial properties and makes your body sweat out nasty toxins. And it tastes great in this soup, added in the cooking process and again finely minced and stirred through at the end. The final essential ingredient for this soup is the home-made, thoughtfully prepared chicken stock. Apologies, but the pre-packaged store-bought variety which is usually just salty water, just won’t do here. If the prospect of making your own chicken stock scares you or isn’t something you’ve ever bothered doing preferring the purchasable convenience, I can offer assurance there is no comparison taste-wise between the home-made variety and the stock-standard cube. Plus if you’ve made it yourself, you know exactly what’s in it and it’s not likely you’d be adding extra flavour and colour enhancers or, gulp, MSG which is found in some of those mystery parcels. Next time you roast a chicken, and go organic for extra taste and goodness, throw all of the remaining bones and bits in a pot with water, sea-salt, peppercorns, parsley, celery tops, onion, bay leaf and half a lemon. Bring to the boil then simmer for a few hours – don’t bother skimming off the fatty bits because you’re going to strain it afterwards. Then place in containers , freeze or refrigerate if using within the next week. Or, start from scratch with one kilo of chicken necks and feet using the same method. Or even better, use this genius method to make a chicken stock from scratch in fifteen minutes ! Flu-Shot in a soup bowl :-), and unless you are watching you grain in-take, make sure you serve it up with some very garlicky bread or giant garlic croutons drenched with olive oil for an added hit. 1) Carefully slice the top off the head of garlic making sure it all stays in-tact, then wrap in foil and roast in 200C oven for 30-40 mins, or when smells amazing and is just caramelised. Birthday parties for kids are generally speaking synonymous with one thing – sugar, sugar and more sugar. I shudder thinking of years gone by, gracing the lolly aisle of the supermarket investing in giant-size bags of all things equivalent to zero nutritional value and great expense resulting in short-lived sugar hit highs for all and added reasons to visit the dentist. I once jokingly informed my daughter one particular year, we were going to have vegetable bags instead of lolly bags – cut up pieces of celery and carrot in shapes of lollies, and also broccoli chips. This idea was met with a very disappointed expression and the irony was lost on her, so it was back to the lolly aisle once again. A decorated birthday cake can be a virtual work of art. Over the years I have occasionally splurged and ordered gorgeous custom-made and individually decorated cakes as am simply not skilled enough to make such a creation and there’s one less thing to think about on the day of the party. Additionally to the lolly bags, the actual birthday cake can also be an extra vessel for all things sugar and fat. Besides being visually attractive, cake batters are traditionally all butter, sugar and flour and then loaded with frosting which is also just more butter and icing sugar. Not to mention all of the other sugary trimmings on top of the icing, like crushed up Tim-Tams or shredded Mars-Bars with individual slices topped with scoops of Ben and Jerry’s Choc-Chip Cookie Dough – not something you’d want to consume everyday, once a year is enough. Yes, there are many versions of ‘healthy’ cakes whether they be gluten-free, flour-less, sugar-free, fat-free, made out of vegetables even, falling short of putting a cauliflower head on a plate with some candles stuck in it, there can’t be anything healthier than the Watermelon Cake. Whoever invented this idea is a genius. 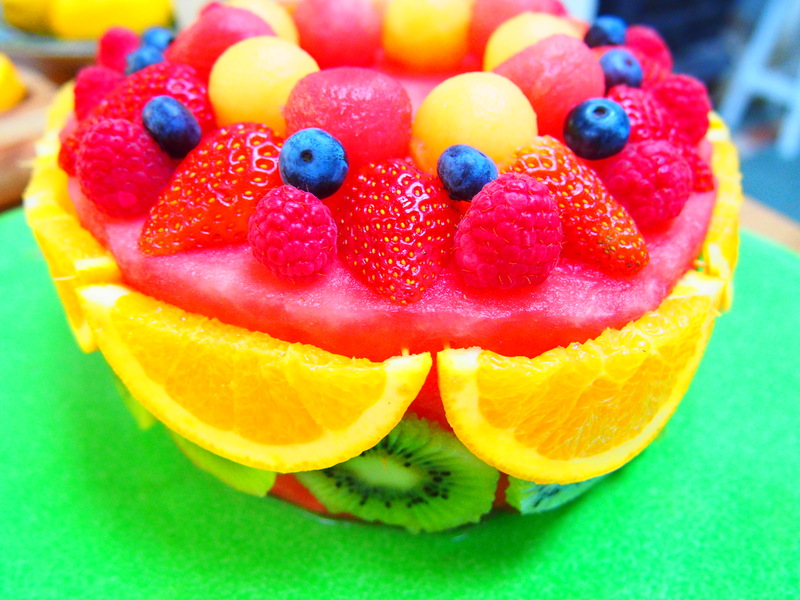 Really, it’s just a fruit salad but is in cake form as opposed to chopped up little pieces in a bowl. But trust me, when it comes to assembly and decoration of a watermelon cake, I really can’t remember having this much fun in the kitchen, ever. And, with the knowledge that you are creating something that is also extremely healthy – fat-free, gluten-free, wheat-free (not sugar-free because of the high fruit-sugar level but it’s not the dreaded refined variety) this is most certainly a win-win situation. 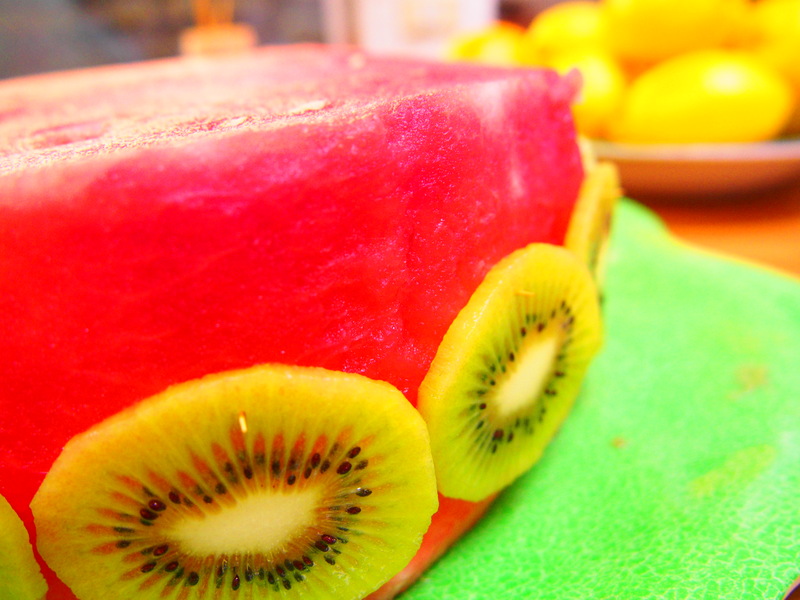 The trickiest part about making a watermelon cake, is getting the desired shape. Topping and tailing a watermelon is potentially a perilous exercise without the aid of a very good quality razor-sharp kitchen knife. After each end of the watermelon has been removed, it’s then just a matter of carefully trimming off the skin and all the white melon part so that all that is left is the juicy vibrant red bit, sculpting as best you are able into a ‘cake base’ shape. 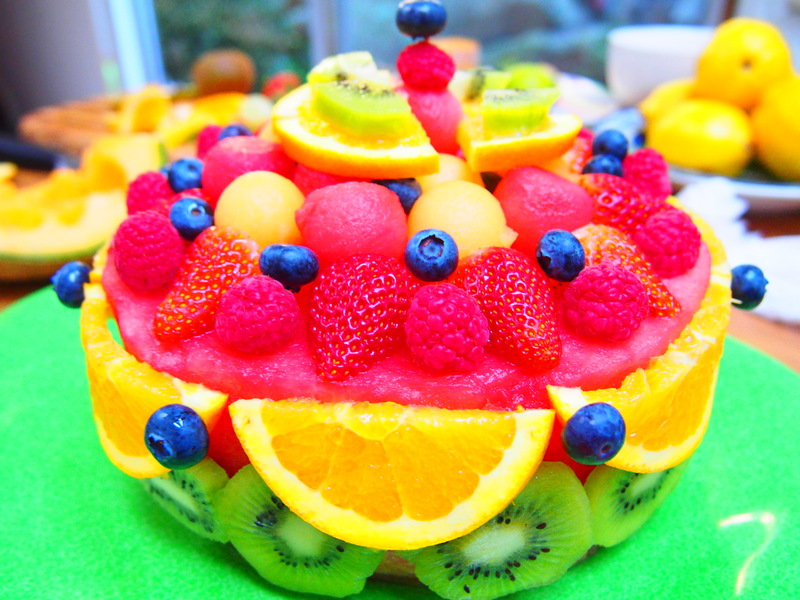 Once you are happy with the shape, it’s time to start decorating and creating your work of ‘fruit art’. 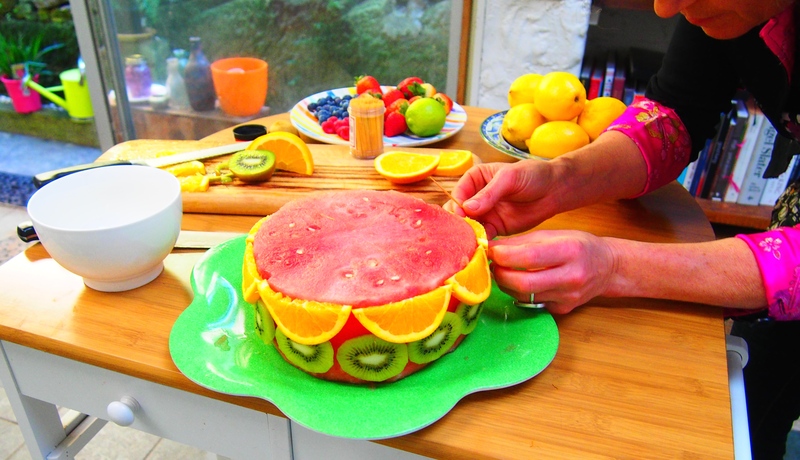 Using tooth-picks, secure the fruit to the outside of the cake like pictured. 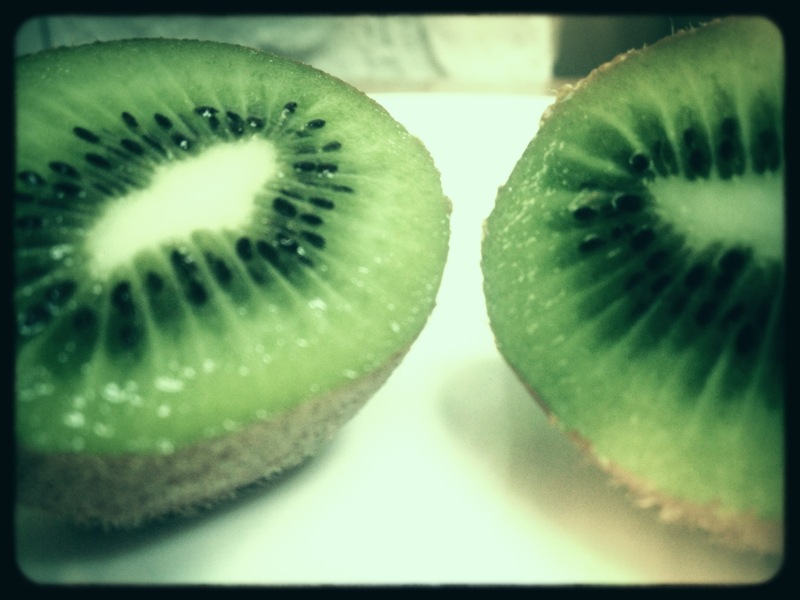 I started with peeled and thinly sliced kiwi-fruit, and slithers of oranges. Next it’s time for the berries to work their visual magic – raspberries, strawberries, blueberries arranged in whatever creative way imaginable. Blackberries and Mulberries and pomegranate could also be used. And a very useful tool is a melon-baller – use this to scoop out cute little melon ball shapes out of the discarded watermelon tops, and some rockmelon then pile on top of the cake between the berries. I was slightly naughty at the end and added a dusting of vanilla sugar all over. This cake isn’t just for kids, an adult-only version can also be made. 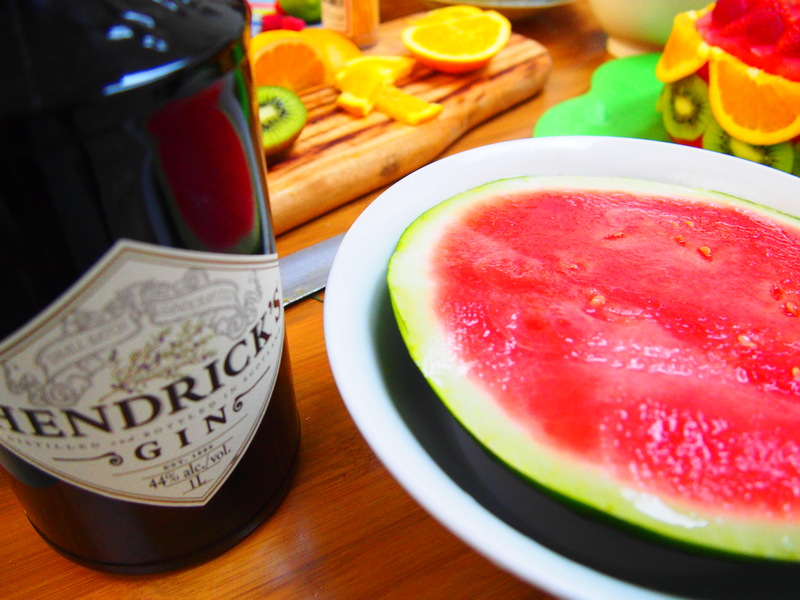 We all know how wonderful Hendrick’s Gin and cucumber is, well there’s no surprise it also pairs extremely well with watermelon. You go about making the cake exactly the same way except prior to starting the decoration, pour a generous drenching of Hendrick’s over the cake base and let infuse for a few hours in the fridge. Then get creative with a fancy mandolin slicer and use cucumber as decoration instead of or as well as berries. There can’t be too many of us who haven’t ever subjected our bodies to some kind of ‘diet’ at some point in our lives. And for what ever reason it may have been for, undoubtedly would have been to lose weight. I’ve tried a few in my time – Weight Watchers, Jenny Craig, The Liver Cleansing Diet, The Scarsdale Diet plus others. Out of these I think the Jenny Craig version was the most successful and easiest, only having to pull out little boxes of pre-prepared meals from the fridge and not really having to think much about it except for payment time as was quite a costly exercise and to be honest, quite bland food – not much love there. However, the goal of losing kilos gained during pregnancy was achieved at the time. But, I never really knew what I was consuming or how it had been prepared, something I am far more interested in now, almost a decade later as a result of the ‘dining boom’. 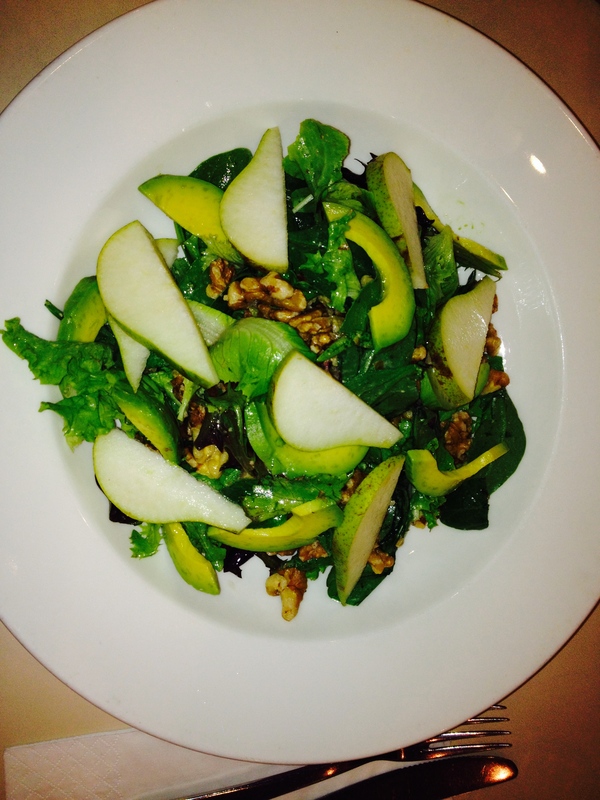 More recently I have become an advocate of good food consumption and it’s direct impact on health and well-being. This is an ideal of which there is no shortage of information available to us now on the internet or via nutritionists and dietitians. These are the principles that many of us follow everyday in our meal choices today, but sometimes the information given to us can be overwhelming and it may be challenging or sometimes difficult to adopt good eating practices. Especially when you start googling everything in relation to diet and just what we should be putting in our bodies, you’ll find relevant and helpful information yes, but also contradictions within the mountain of information available at our fingertips.. It all began when my daughter became very ill, culminating into her not being able to move at all eventually (we had to carry her up and down stairs and lift her in and out of baths/cars etc) over a period of months and was eventually diagnosed with an auto-immune disease labelled dermatomyositis some years ago. As we were told by doctors at the time that this was an extremely rare disorder and they knew not of the cause but only how to treat the symptoms, it was up to us to do our own research to find out any information we could. An often unrewarded path being a rare condition and very little information existed anywhere except drug information in relation to treating the disorder. The drugs did indeed help the symptoms but had very nasty side-effects, one of which was immune suppressing – the very essence of what needed to be healed the most. So, it was not making much sense and did not seem like a sensible long-term option as they were really just masking her symptoms, not curing her. The ordeal lasted almost three years, of which one was spent dragging her to hospitals and specialists, including invasive procedures like painful muscle biopsies before she was actually diagnosed. A glimmer of light was shone on the whole affair eventually after I was referred by a family member to a very knowledgeable naturopath who not only had heard of the disorder (as many other medical practitioners surprisingly had not), but had also treated another young patient with dermatomyositis back to health through a combination of natural herbal remedies and a diet consisting of organic, good, fresh food – nothing processed and no refined sugar. This naturopath told me that all diseases begin in the gut, and even though we didn’t know what had caused the disease, it was the gut that needed special attention in order for the healing process to begin. The feeling of relief, firstly that someone out there finally had answers to a cure as well as an understanding of the process of recovery for this disorder was indescribable at the time after having almost nothing else to go by till then. The elimination process of non-helpful (processed and glutenous/sugary) and insertion of fresh, healthy variety foods began, and we watched as she eventually recovered while being weened off the drugs till non-existent and her good health finally returned. I witnessed first-hand how a truly good, sensible diet can eliminate disease and have a positive impact on health all around. Where does Paleo come into this? Well, approximately one year ago it was I who became unwell. After a particularly gruelling few weeks of work/sleep deprivation at the Tamworth Country Music Festival the end result was sheer exhaustion and absolute depletion of energy to the point of almost being incapable of anything other than being immobile lounge lizard all day. On top of this there was digestion issues and headaches and I thought something more serious than exhaustion must be going on. A visit to the doctor and a few tests revealed nothing other than that. Just plain old exhaustion, the remedy being to keep lying on the lounge and to do absolutely nothing for a week. At this point is where the decision was made to really scrutinise what I was eating and to see if I would feel any better by adopting a sensible diet to aid in the recovery process as I had been through with my daughter. I didn’t take herbal remedies except drank green tea and knocked the coffee on the head too. All grains were eliminated, mainly pasta and bread and consumed nothing that came in packaging of any kind (I believe any food presented in a packet has at some point been processed in some way). Then went the dairy – no milk or cheese, the cheese being difficult not to have as I love it so much. Instead, it was vegetables, vegetables and more vegetables – salads, steamed or raw vegetable concoctions and lots of boiled eggs dusted with turmeric. If an attack of the hungrys occurred, I’d have a few raw almonds, walnuts and cherry tomatoes – was purchasing those by the palette load. Yes it was a hard-core approach to begin with. I included a reasonable amount of fish, and never having been a huge red meat-eater anyhow, kept this to consumption maybe once every two to three weeks. And this would be served in the form of a top shelf grass-fed eye fillet, served pretty much rare. No processed meats of any kind, and everything was cooked in coconut oil or good quality extra virgin olive oil – the good fats. Basically, before putting anything in my mouth I was utilising common sense assessing the nutritional value while not being overly obsessive about it, and making sure everything was as fresh and as healthy as possible based on the principle of trying to digest only good food in order to feel better. It was a simple way of eating and I never consulted any diet site or scientific studies in regards to food, just got back to the basics. And, there was no surprises as it was only a matter of weeks when my energy started returning and the health problems departed. As a pleasant and unexpected side effect, there was also weight loss. It was interesting that this had occurred, when it had not been my intention and had not being following a specific ‘diet’ of any kind. Following an eating regime consisting mainly (not always as mentioned above) of vegetables at main meals, it’s a challenge to keep coming up with new and interesting ways to serve them, without the assistance of flavour enhancers. Again, there is a minefield of recipe sites devoted to this but investigation can be mind-boggling and confusing. Till the day when was given a few lovely plump pumpkins from my mother’s thoughtful vegetable garden in the Hunter Valley when I decided pumpkin soup was best way to utilise this produce and I stumbled across a fabulous recipe of Spicy Coconut Pumpkin Soup on a website dedicated to all things Paleo. Not only was this recipe a complete winner, it was also of Paleo nature which was a bit of an enigma to me at first. I’d heard of it but like many others immediately associated it with visions of dinosaurs and cavemen, so decided to research it more as the soup was so incredibly tasty. During investigation of Paleo principles I discovered that this was actually the way I had been eating and the path I was on. Further discovery revealed that this way of eating and lifestyle can be adopted as a way of life to prevent a multitude of diseases besides just inducing weight loss. It was quite a revelation to discover that what I had been doing via common sense and because of previous health issues suffered by my daughter, actually had a name and was a so-called ‘diet’. A year has passed and I still continue to follow the Paleo principles of eating, and probably will for the duration of my life. I have discovered that Zucchini is far more versatile vegetable than ever imagined and many other ways with vegetables to make you wonder how you ever needed pasta or bread in the first place. However do nowadays allow myself the odd ‘non-paleo’ treat occasionally as also firmly believe in the old saying ‘everything in moderation’. I just make sure the non-paleo treats are of extremely good quality, like a spectacular piece of creamy Dauphinoise cheese, spread over a french baguette freshly baked and still warm, with a nice glass of red. I mean, who can resist this? One of my most favourite things. Just as long as you don’t do it every day because you will appreciate it more when it is only very occasionally. 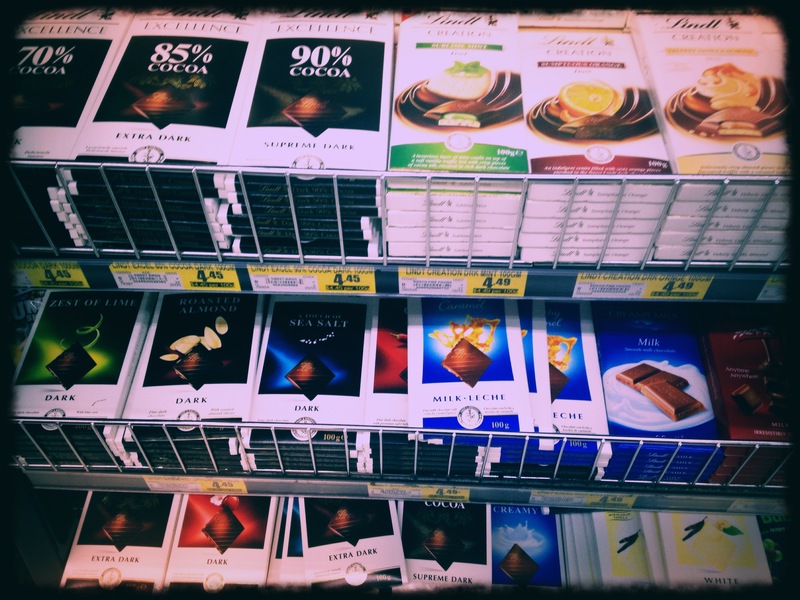 And this includes chocolate too, go top-shelf for these rare occasions. It’s all about how good you feel when you make wise and sensible food choices, that’s my take on Paleo in a chestnut shell. *Here is the recipe for the pumpkin soup from this fantastic website Eat Drink Paleo plus plenty of other great food ideas. ‘Wrap Your Troubles In Dreams’, ‘Wrapped Up In You’. Anything that comes in wrapped form usually means there is a hidden treasure inside just waiting to be revealed. Brown paper packages wrapped (yes I realise it’s actually ‘tied’ in the lyrics) up in string must be favourite things for all of us. ‘Wrap it up’ (I’ll take it) by the Fabulous Thunderbirds, ‘Christmas Wrapping’ by the Waitresses or who could ever forget ‘Wrap Your Arms Around Me’ by Agnetha Faltskog. How about food being wrapped up, how about that. Who hasn’t experienced the wrap? Who hasn’t ordered a mystery parcel in the form of a sour dough or wholemeal wrap at a lunchtime sandwich bar? You may have ordered a salad, teriyaki chicken or a roasted vegetable wrap. A ham and swiss, a bacon and egg, or a smoked trout, beetroot and horseradish wrap, how divine. Whatever sort of wrap you have chosen, it will undoubtedly be wrapped. Unless you unwrap the wrap and who would do this unless it’s not been assembled correctly in which case easier to consume in the unwrapped version where the ingredients just spill-out everywhere. This scenario is fine considering all contained ingredients are thoughtful, tasty, fresh ones plus a knife and fork on hand. Wrapping a wrap is indeed an art-form, it’s all about placement. And then there’s avocado wrapped eggs. For the last few weeks have seen pictures flung all over the internet of eggs inside avocados, you may have seen similar visions. Sometimes cooked, sometimes even raw which would be a major protein hit and highly nutritious mono-stereo fat hit. This has been intriguing and have clicked on the links only to find that this is not a recipe at all but a site selling the miracle weight-loss cure called Garcinia Cambogia. I didn’t want to lose weight only wanting to find out more about those eggs and avocados. There is no recipe or any other mention at all but of course further googling uncovered several recipes for avocados and eggs. 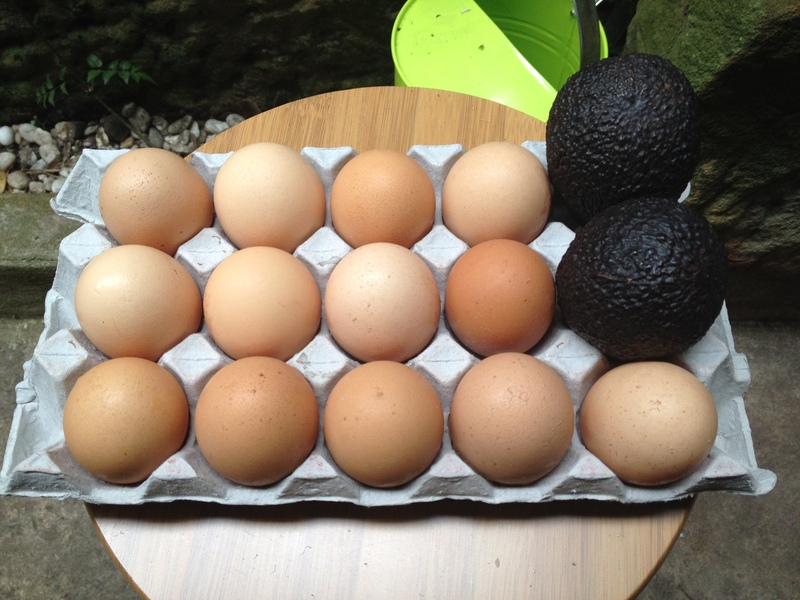 If there is any food that is going to wrap up another food, avocados and eggs are pure chemistry at its best. (Possibly only surpassed by grated lime-soaked carrot, garlic, mint and ginger wrapped up in chinese cabbage leaves). As you’d expect, there are varying recipes for this type of dish – some calling for roasting the avocado with an egg cracked into its cavity. Personally am not a fan of baked avocado, finding the room-temperature sublimated flesh of a fresh, uncooked avocado irresistible. 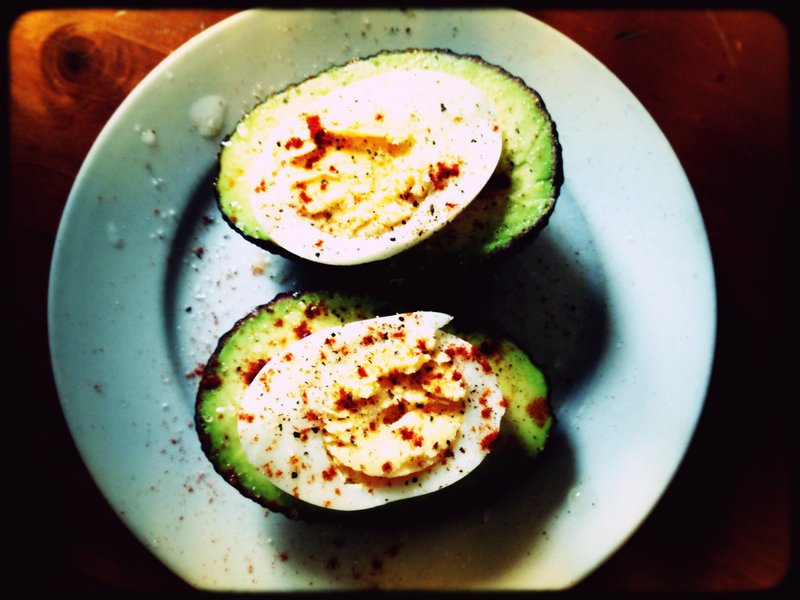 Poaching or boiling an egg and then placing into the avocado cavity splashed with lime juice and a dash of olive oil, seasoned with sea salt, cracked black pepper and a sprinkling of smoked paprika is truly something else. So basically simple and easy to assemble, this dish would appear to be a breakfast option but can be experienced any time of the Night Or Day. Remove a decent scoop of avocado flesh from each half. (Just enough to make room for the egg and at least half of it left as texture – don’t bother reserving the flesh for another use, consume immediately). Place boiled egg halves or two poached eggs individually in each cavity and sprinkle over sea salt, pepper and smoked paprika. 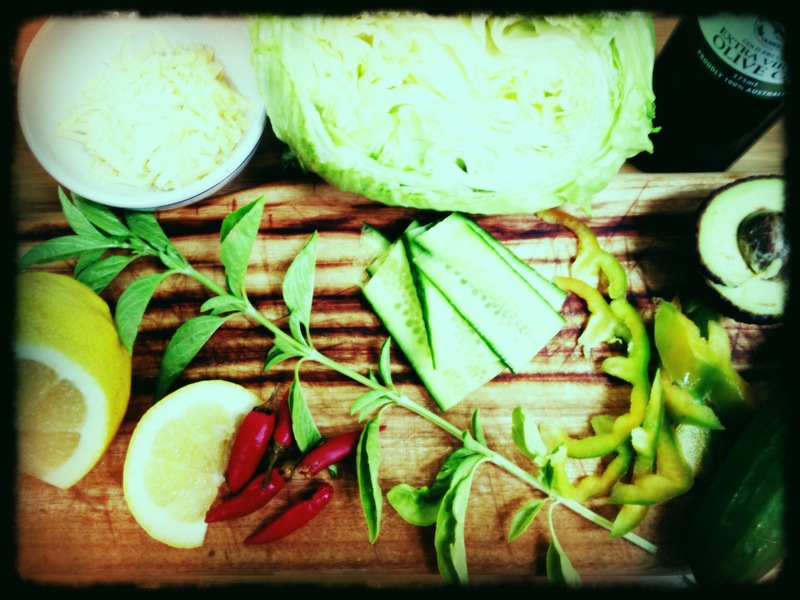 Wrap all listed ingredients inside the iceberg leaves same as you would do with San Choy Bau.